X1 Tilt Top Base 100 with HPL tabletops are a popular choice for foodservice and hospitality environments. 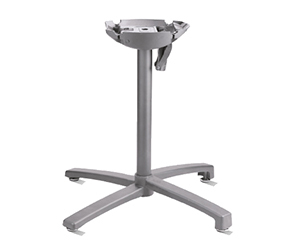 18" wide, 28" tall X1 base 100 utilizes a fusion of aluminum reinforced fiberglass construction, designed with a patented folding system to deliver a stable, space saving solution. These stylish, contemporary bases are specifically designed to work in union with high pressure laminate French Touch 24" square tabletops. With the highly elusive combination of both beauty and strength, the X1 Tilt Top Base and optional French Touch HPL tabletops are resistant to scratch, burn, stain and high heat—maintaining the original elegant characteristics throughout years of indoor or outdoor use.